Once upon a time, I wrote a book. Well, technically I’m still writing it—I’m in the (hopefully) final stages of editing and preparing to query agents. 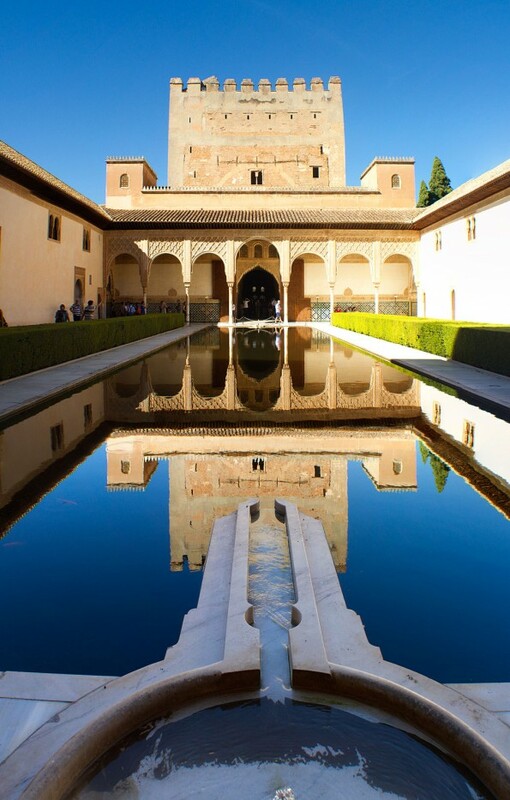 That place was none other than the Alhambra Palace of Granada, Spain, and visiting it was everything I hoped and dreamed it would be. 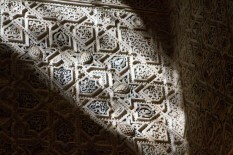 Leslie: Yes, the Alhambra was A.MAZ.ING! This, for me, was another of the highlights of our trip. I love that statues of the Apostle Peter are always easy to identify by the symbolic keys he holds. This place was massive and right in the heart of the city. I couldn’t get a shot of the whole thing from right there, but there is one later in this post. 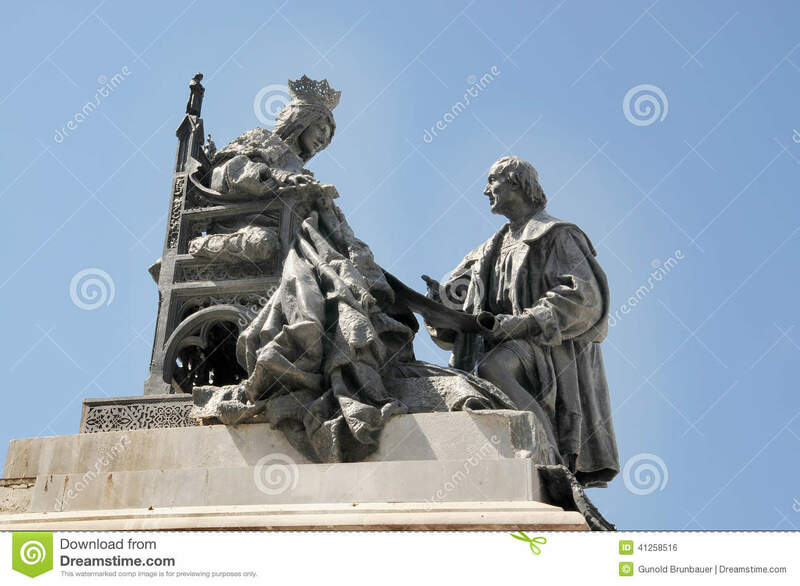 This is a statue of Queen Isabella agreeing to finance Columbus’ famous voyage. I love the incredible details in this statue—right down to the strings on her seat cushion. You can see the rest of the statue here. 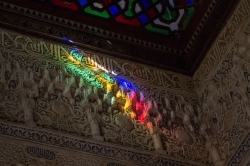 Our tickets to Alhambra wouldn’t let us in until a certain time, so after we dropped our bags off at our hostel, we spent a little time exploring the city. 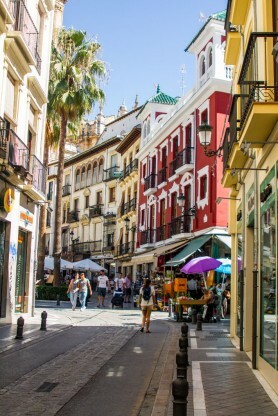 We ate lunch at an outdoor café, walked around the outside of the massive Catedral de Granada, and admired the color and smells and details that make Granada so beautiful. 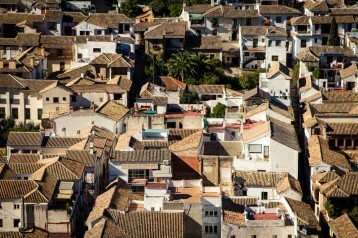 Leslie: Getting out of the big cities was a fantastic change, too. 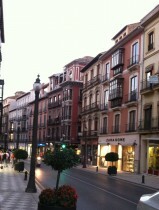 The smaller city of Granada, the slower pace, everything about the city made it fun to walk around and explore. Make sure you buy your tickets well in advance because they tend to sell out. 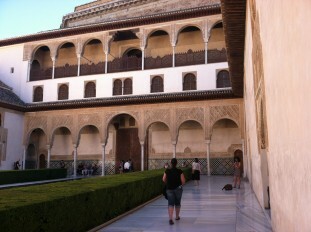 We almost didn’t get to visit because all of the regular tickets to the Alhambra and Nazrid Palaces were sold out. Thank goodness I discovered that they still had a few combo tickets with the Rodríguez-Acosta Foundation left. We didn’t end up seeing the other building, but it was worth it to pay an extra couple of Euros to guarantee that we’d get to see the palace. 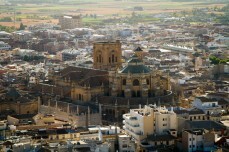 Granada is especially beautiful from above, where mountains and Mediterranean charm combine for a breathtaking view. But the moment that stole my breath the most was when I stood in the very spot I have longed to stand in for years and took one of the best photographs of my career. I’ll be right back. I’m just going to stare at this photo for a while and remember the time when I stood right there. 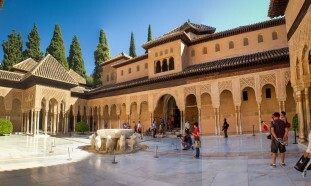 The main attraction at the Alhambra is the Nazrid Palaces, a collection of rooms, halls, and courtyards built for Mohammed ben Al-Hamar in the 13th century. 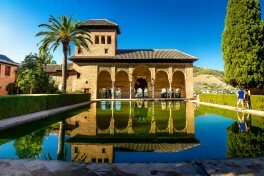 These palaces were home to the Nazrid Sultans, the last dynasty of Hispano-Arab governors of the Andalusian region, until the fifteen century. 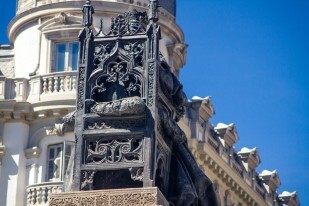 They were later used as the royal court of Ferdinand and Isabella, and it was here that they endorsed Christopher Columbus’ famous journey. 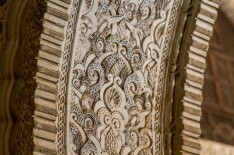 Muqarnas are an icon of Islamic architecture. 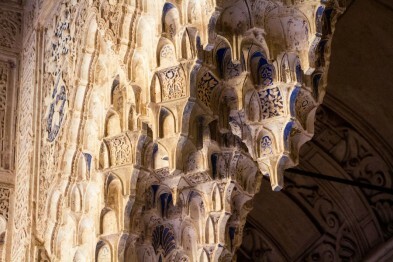 They developed in the 10th century and resemble stalactites. 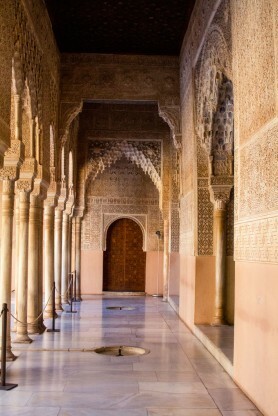 Leslie: The colors, the wide array of materials used, the textures of all the Moorish architectural details…all of it is incredible. 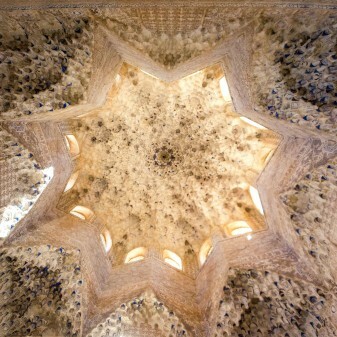 I especially loved the parts with tile mosaics, but those ceilings with the stalactite designs (muqarnas) were definitely unique and beautiful. 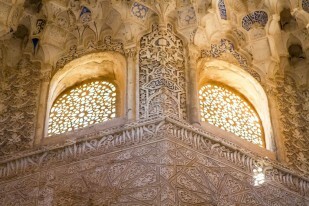 It seemed like every square inch of the palace was carved or painted or otherwise decorated. I cannot even begin to describe the effort and talent that went into building this place. Everywhere you look, there was some new detail to look at. 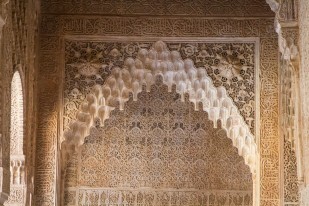 Leslie: The Alhambra was stunning. Pictures won’t do it justice. 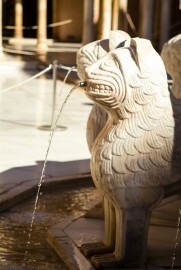 This courtyard was constructed in the 14th Century by Nasrid sultan Muhammed V.
Much like the baptismal fonts in LDS and ancient Isrealite temples, this fountain is comprised of a basin resting on the backs of twelve animals, which represent the twelve tribes of Israel. 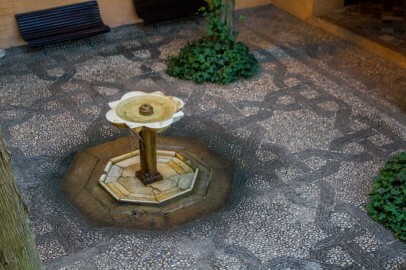 I’ve also never seen so many courtyards in my life. 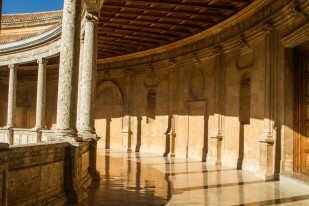 It’s easy to guess why—the paradisaical climate of the Mediterranean just begs you to spend all of your time outside. 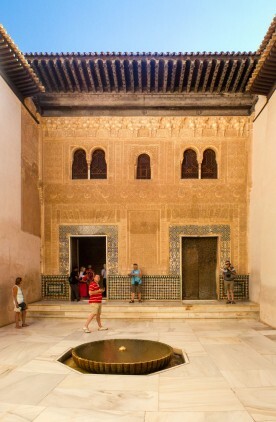 It doesn’t take much imagination to picture these courtyards filled with the Sultan’s guests. 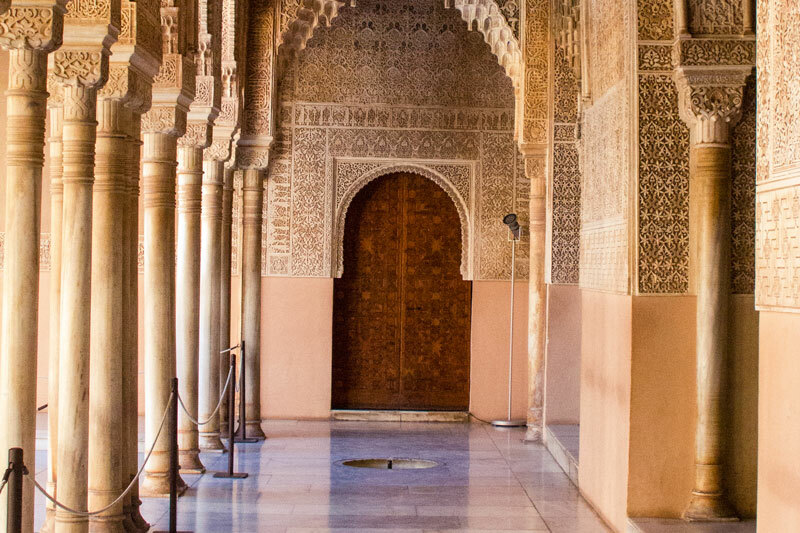 After spending hours exploring the Nazrid Palaces, we visited the Palacio de Carlos V, a Renaissance-style palace that was never completed. 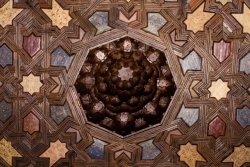 It’s an interesting structure—square on the outside, circular in the center—and it is currently home to a photography exhibit by the insanely talented Fernando Manso. Let’s just say I was feeling pretty good about my photos until I saw his. HA! 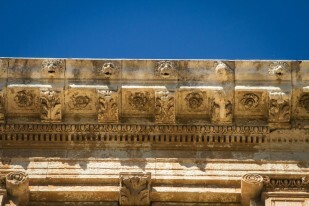 This area was built as a military post, and dates back to the time of the Caliphate. 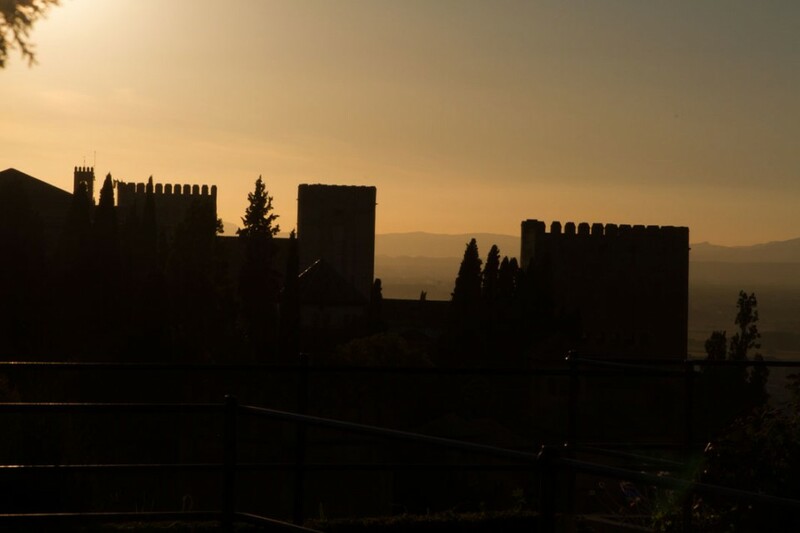 The towers provide the best views of Granada. 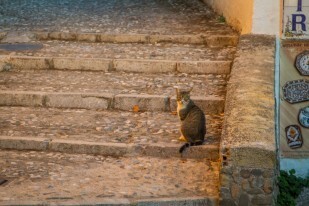 Time was running short at that point (thanks in part to me losing my ticket and backtracking to try to find it…), so we had to rush through the Alcazaba and the gardens of the Generalife. 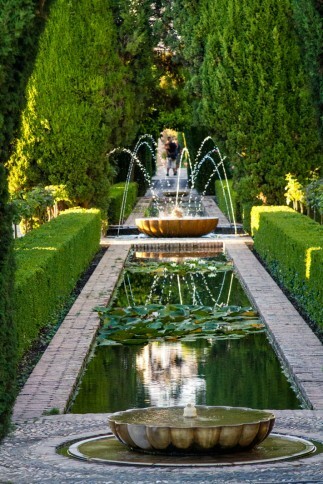 I would have loved to spend more time in the Generalife, especially. 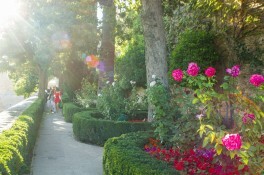 The gardens were exquisite. Still, as we waited for the bus to take us back down to Granada, I couldn’t help but feel like I’d just had one of the best days of my life. 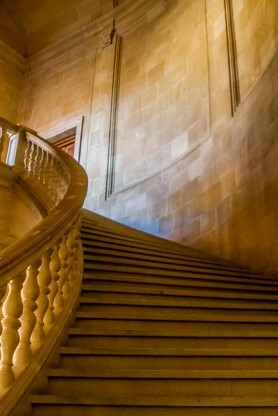 It was kind of surreal to see something that I had been eager to see for so many years and to imagine my characters coming to life within those halls and courtyards. Thank you for an inspiring day, Alhambra. You’re amazing. 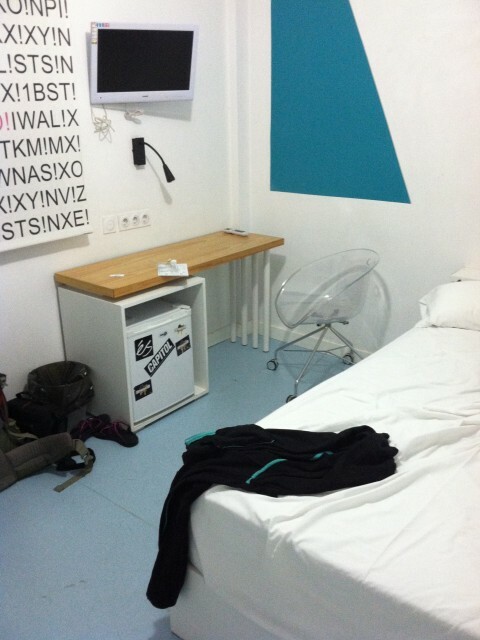 + Very clean and quiet hostel. It was nice to have a private room and en suite bathroom, and the room was very comfortable—except for when I stubbed my toe on the bed frame so hard I thought I had broken my foot. Leslie took a picture of me crying on the floor. 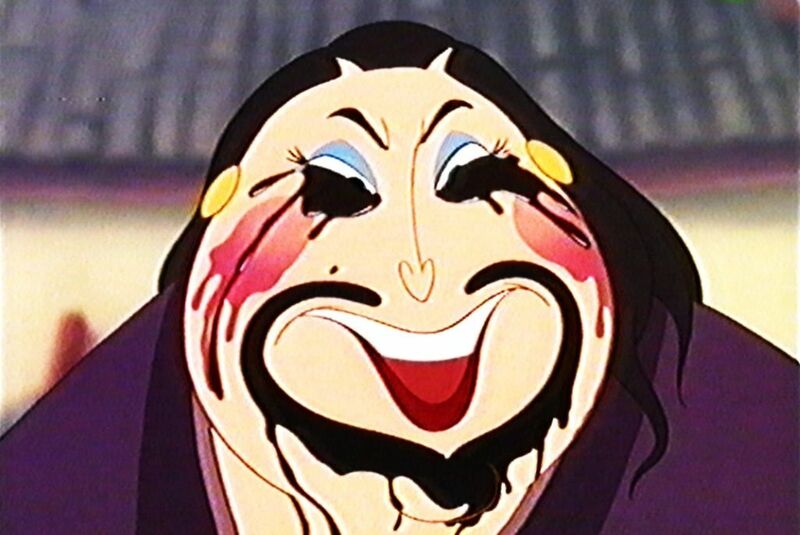 I looked like this. – It was quite a long walk from the train station when we were carrying heavy packs. Had we known, we would have gotten a taxi instead.